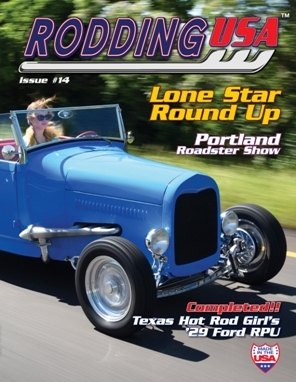 Rodding USA magazine's Issue #14 is in stock and available to order now. Magazines ship next day. Issue#14 features something old from someone new. Young Sarah Hoffman built her own 1929 Ford roadster pickup and it’s a compelling story. We back that with features on Howard & Sharon Radtke’s ‘32 Ford roadster, Ronald Hoffman’s ‘30 Ford sedan, Ron & Sue Sellon’s ‘54 Ford coupe, Norm Cox’s ‘49 Plymouth coupe, Frank Brown‘s survivor ‘32 Ford roadster and ex racer Harry Lindsay’s ‘32 Ford coupe. Our Special Interest features highlight the anniversary of the 1940 Ford, the Goodguys Show in Scottsdale, AZ and we drool over Doyle Gammel’s collection of true Southern California hot rods. We also take a peek behind the garage doors at a Model A phaeton in the build and cover PCVs in a tech article. Our event coverage focuses on the Portland Roadster Show, Lonestar Roundup and the outdoor show at GNRS. All that plus our regular columns, showcases and our growing dealer network. Rodding USA, by hot rodders, for hot rodders.